Speaking of resolutions, this isn’t one, but I was actually quite domestic tonight and am unjustifiably proud of getting many loads of laundry finished as well as dishes and making an apple crisp. Actually I accidentaly put in too much butter, but I think it will turn out tasty nonetheless. I’m not sure I can promise to be chock full of sweetness and light since I think it might be cathartically fun to be cruel for no reason, but the chances are good that I won’t try it. And speaking of nice, did I mention there’s no comics content here? None! This is the first of a pair of Retro Rib socks from the latest (Winter ‘04) issue of Interweave Knits . I made them an inch or two shorter than the pattern suggests, but otherwise didn’t change anything. I used Silja Strompegarn superwash wool (color 331) on size 1.5 US needles. It’s a rough machine-washable yarn, and I like it a lot. I’ve made several pairs of socks before, but this will be the first for me to keep. The flash made these colors much more washed-out and yellowy than they appear in person, but they also look amazingly garish under fluorecent lighting. The color is more true here, where I give a closeup of the heel. I haven’t made this stretchy slip-stitch heel before, but it seems comfortable so far. 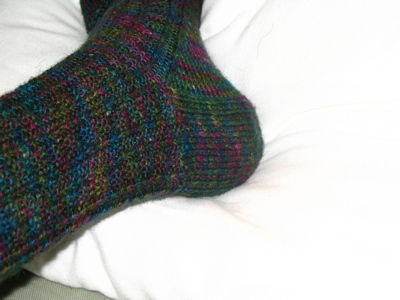 And see, this proves I can knit and take photos of my feet! Well, proves it if you believe I did both those things, which I did. So there! 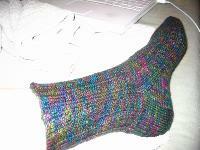 This entry was posted on 12 January 2005 at 3:27 am and is filed under Knitting. You can follow responses with the Atom comments feed. Responses and trackback pings are currently closed.